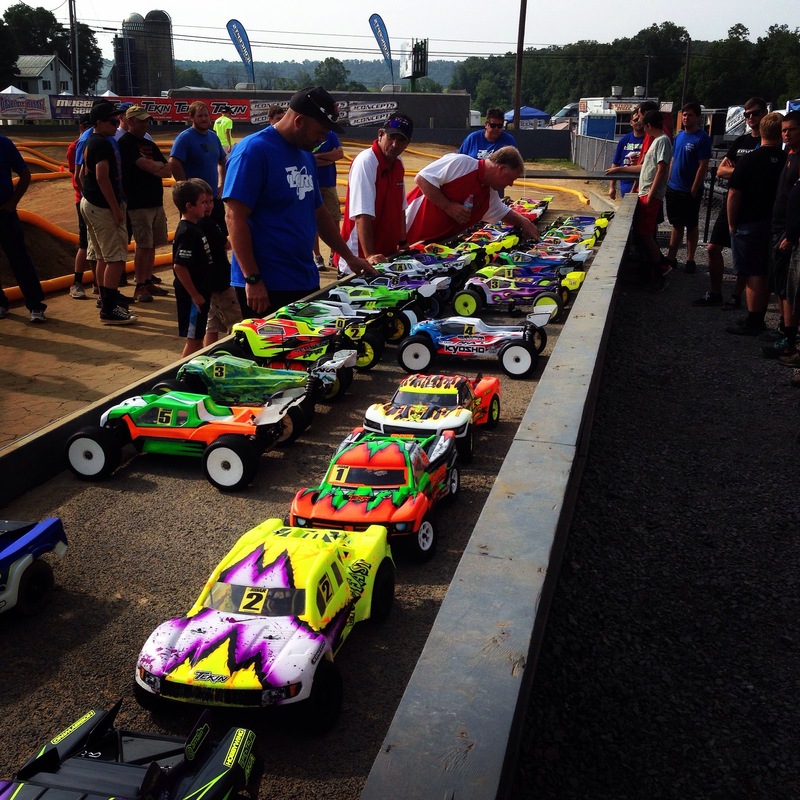 I’m headed out to PA for the 2015 ROAR 1/8 Electric Nationals held at LCRC Raceway. 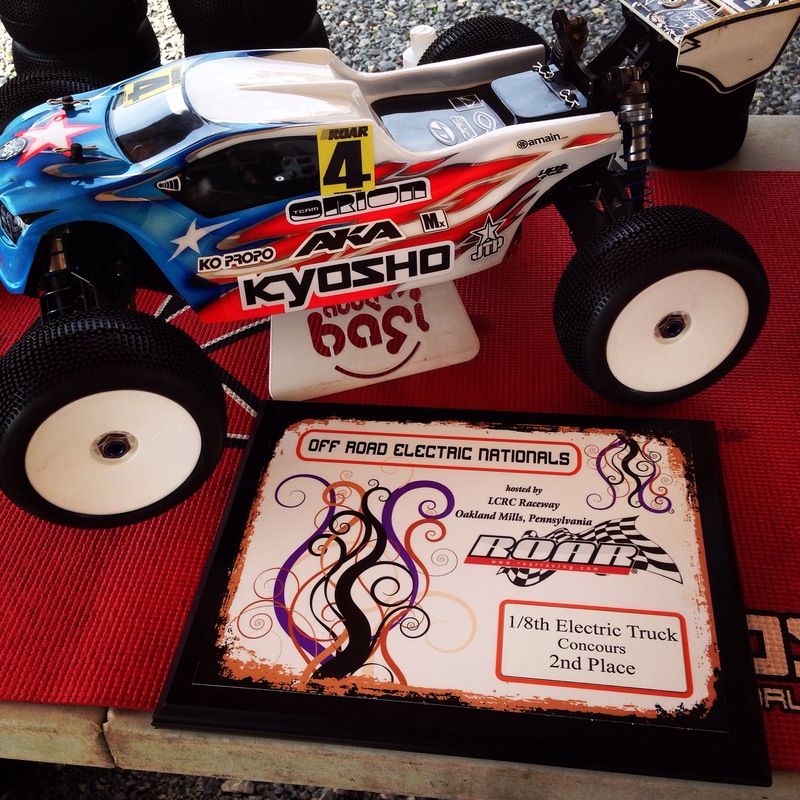 I will be racing both Electric Buggy with my Kyosho MP9e TKI and Electric Truggy with my Kyosho STRR Evo2 electric conversion. Joe and I fly into Philly, then we are on the road for 2.5 hours deep into the windy roads and beautiful hill country of Pennsylvania. We are treated with tons of on and off rain showers for the entire drive. As we drive by the exit for the track, there is a total downpour going on, about 20 minutes later, we arrive at our hotel. Practice is starting the next morning, but I was thinking the track would be totally under water. 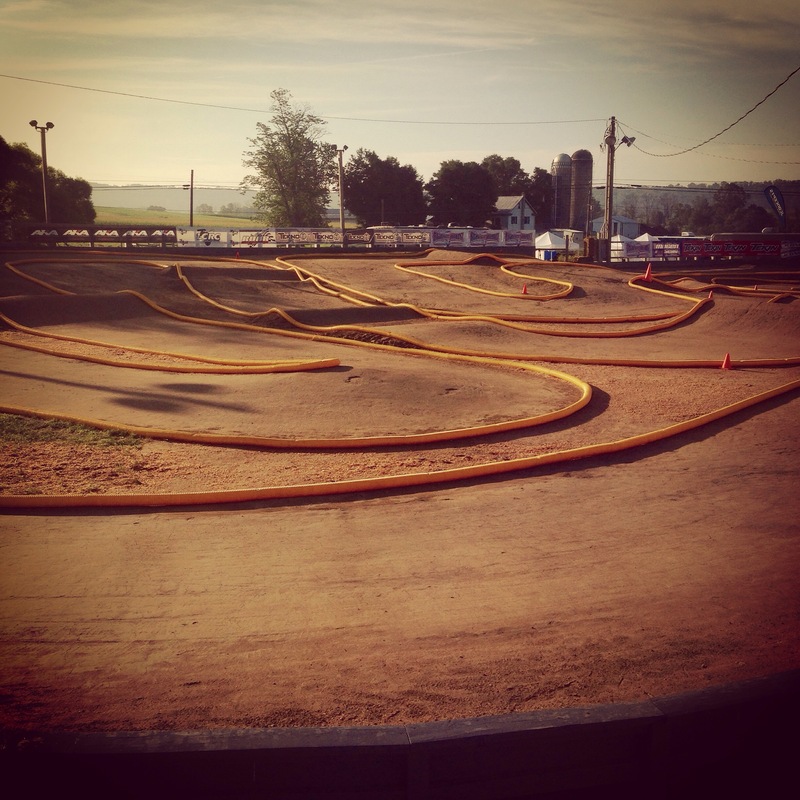 Thursday Practice is here, and to my surprise, the track is looking great as soon as we get there. We had two rounds of seeding practice with each car. Track started out a little green with the rain, but quickly came in and was feeling pretty good. I had been to the track back in 2012, but the dirt had changed a little from what I had been told. My cars were feeling ok, and I was getting the feel of the track layout pretty quick. I was trying to get more speed out of me or my cars, the day was going similar to how practice went in Chico, CA for the Nitro Nationals. My cars felt decent, and I was driving decent, but my lap times were way off pace to where I would normally be. We got both seeding runs for truggy, but before I got to run my second practice with buggy, major down pour and we were done for the day. Friday would be Q1 and Q2 of qualifying. Just like the previous day, having tons of rain in the evening and through the night, the track looked good when we pulled up. First up would be Truggy. 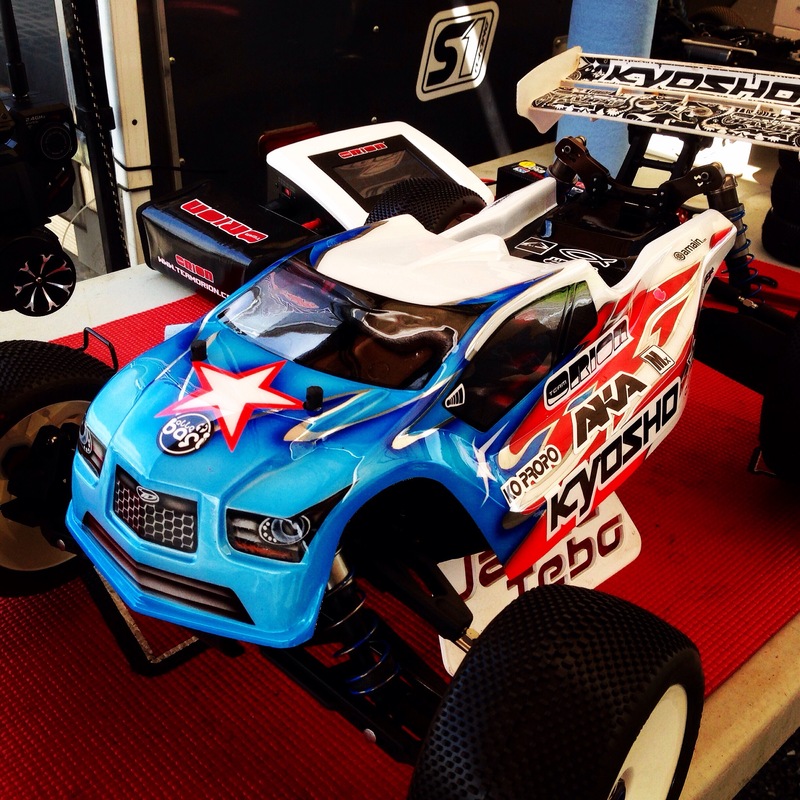 My speed still wasn’t where I wanted, but I drove good and was clean for the whole qualifier and took a 3rd for Q1. Buggy was next and I wanted to do the same thing, but I didn’t drive as clean and made some mistakes and took a 4th in Q1. Q2 wouldn’t go in better direction. Truggy I just had a really bad run and a ton crashes. Couldn’t find my rhythm and had a run I would like to forget. Buggy I made some changes and my car felt great in the warm up. My race was short lived as I made a huge mistake on the second lap ripped my front right side off my car. I was bummed because I felt like I was going the right direction with my changes, and felt like I was going to be fast that run. Rough Q2 all around, so we are off to Saturday and Q3 and Q4. Saturday is a new day and feeling ready to rock. Evaluated my cars and made some setup changes with both vehicles. Q3 of Truggy wasn’t a great run, but I was making progress with my truck setup. Q3 of Buggy, was super up and down. I was finally showing some speed and battling up front in the heat and fighting for TQ. My car was feeling much better and faster, and I was finally driving good too. Halfway through the 10 minute qualifier, my car sputtered and rolled to a stop. Finally I was going good, and then a total blow that was not expected. Something happened and the speedo overheated, and it was strange because I never have issues in 1/8 Electric, and had no issues earlier, just a fluke part of racing. Q4 was here and I needed some good runs. I only had one top 5 run in each class, and I only finished one run in Buggy, so Q4 was very important. Truggy was up and my truck felt the best it has all week. I battled up front the whole heat and finished 3rd for the round and I qualified 4th overall. Buggy was the real key qualifier. 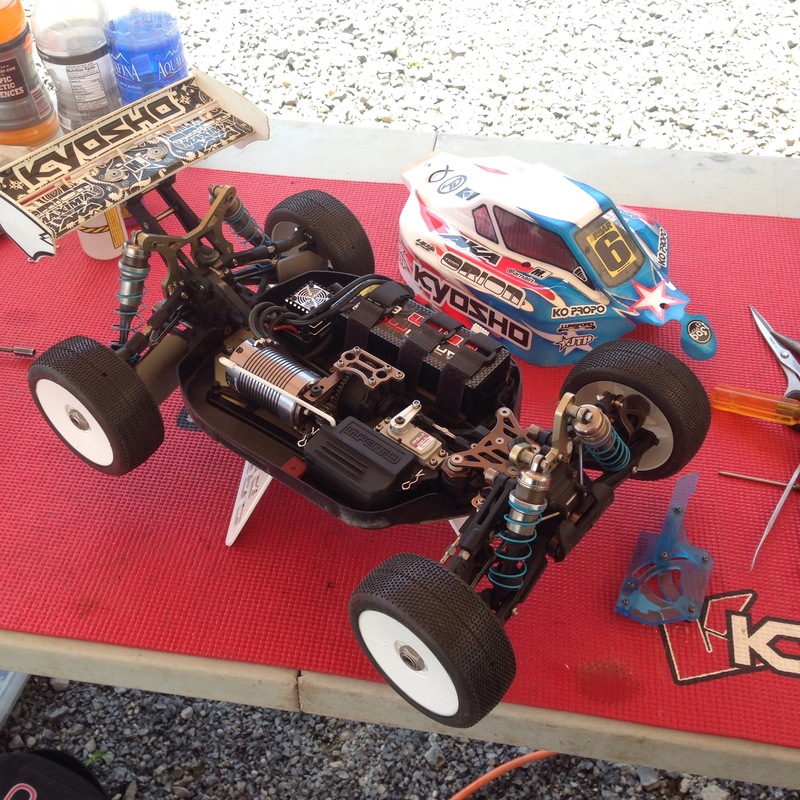 Just like Truggy, my MP9e TKI was feeling better than any other time on the track. I was right up front and going great, leading the heat for about half the race, and then I made a mistake, but I was still close. I didn’t want to push anything too hard, because I was in a MUST finish situation. I ended up 4th for the round and qualified 5th overall for the main event. Sunday Sunday Sunday, and it’s race day. We have triple A-Mains in both classes. Sunday morning also had the concours competition for the best looking cars. Truggy I started 4th and really was the 4th fastest guy. I just didn’t really have the pace to battle with the top three guys. I thought in racing I might be able to get in the mix a little more than qualifying, but I couldn’t. I finished 4th in A1, A2, A3, and for the overall. I got my truck working better, but not the result I wanted. Buggy was a much different story. A1 was a total disaster. My car was really feeling good and I got a good start and made some passes to get into 3rd and reel in the top two. Right when I was feeling really good and gaining confidence, I made a really silly mistake in a turn and dropped a few spots. I was back in the pack battling with the wolves and struggled the rest of the main to finish 7th. A2 was interesting to say the least. Got another great start and got into second by lap 3, then dropped back to 5th, then back up to 3rd and we were about 4:30 into the 10 minute final. The race announcer says that the race has to stop, the computer shut down. I was bummed and happy, I felt like I had the speed to race for the win. We had to all recharge, so they moved our race back about an hour. A2, take 2, and I got another good start, getting into 3rd before halfway, with Maifield and Phend ahead of me. My car was feeling awesome and I was driving clean and confident. I started to catch Phend, who had about a four second lead on me when I got into 3rd. With three laps to go, I was all over him, set him up, and squared up a corner going up a hill and made a great, aggressive pass. I put a little gap between us and had second on lock down, but halfway through the final lap, my buggy sputtered and rolled to a stop again. No freaking way….not again. I was pretty bummed, but there is nothing you can do about that kind of stuff, sometimes your lucky, sometimes your unlucky. Well, actually, I don’t believe in luck, but in racing, things like that happen. A3 was here and all I wanted to do was to drive hard and take a win. We added an extra fan to the speedo, and I was gonna give it all I had. The start this time was rough, as there was a pile up early on the first lap and I was right in the middle of it. I came out around 9th or so on the first lap, and I was ready to charge hard through the pack. I had some great battles coming through and with a few laps to go, I finally caught up to second. We fought side by side down the straight and he was driving defensively and trying to block the inside. Going into a big banked 180, he went in blocking the inside, and I set in more outside and squared it up and made the pass coming out. I finished in 2nd, but with my bad A1 and A2, I only finished 7th overall. Hey Jared great job your cars looked alot better as the race went on. It was great to see you and Joe again. My car had no drive and was generating slow lap times with 5/5/3. I seem to be always going heavier oils to get my car faster and more reactive.